1) Why do we need to cellar our wine in a wine fridge? Fine wine is very sensitive to temperature in two ways. As the wine’s temperature increases, two chemical reactions speed up – one which can be referred to as “aging”, the other which is “spoilage”. The “aging” reaction is the beneficial maturation of the wine which improves the aroma, flavor and structure over time. At higher temperatures maturation happens faster, thus achieving optimum quality before you are ready for it, and forcing the early consumption of the wine. Needless to say, if you miss this “window”, the wine quality will suffer. The “spoilage” reaction, however, works to destroy the wine by “cooking” it, resulting in foul odors and off-flavors. Clearly, the undesirable effects of higher temperatures obliterate any desirable ones, and should be avoided. It is well understood that a wine storage temperature in the range of 55 degrees or so is desirable. At 55, the effects of the “spoilage” reactions are negligible, while the desirable “aging” reactions are permitted to progress at a controlled rate. This will result in a well aged wine within the period of time expected. Storing wine in a closet, basement or under the house or stairs, where the temperature can easily exceed room temperature, will accelerate the “spoilage” reaction dramatically (see chart above). For example, at 73 degrees the reaction is as much as 8 times faster than at 55 degrees. When elevated much above such room temperature, the detrimental effects are dramatically fast, increasing to as much as 56 times that experienced in a proper cellar environment. Proper storage certainly rewards the consumer for his or her care and patience. (The information above was extracted from “The Alchemist’s Wine Perspective” educational newsletter, written by Dr. Alexander J. Pandell, Ph.D., professor of Chemistry and noted expert in the field of vinology for over 30 years. See http://www.wineperspective.com for details. 2) Can I use any refrigerator? Any refrigerator which uses the standard household power of 120V, and which draws 10 amps or less can be used with the WINE-STAT II as an excellent wine fridge. Since it will be operating at a higher temperature, typically between 48 and 65 degrees, it need not be a frost-free model. Interior space should be the principal choice criterion. 3) What about the freezer section of the refrigerator? Can I store wine there too? (or) Will it still work as a freezer? The temperature of the larger storage section is the controlling factor operating the single compressor of the unit; therefore, there is no positive control of the freezer section and no certainty what temperature will result in it. Practical experience has shown that the freezer becomes a small “fridge”, and might be suitable for storage of soft drinks, beer, etc. ; however, no assurance can be given that freezing temperatures might not be reached, resulting in possible aluminum can or bottle ruptures. Adjustment of the relative temperatures of the refrigerator/freezer sections is usually a feature of the unit, so experimentation is encouraged. NOTE: The extra-cost “Freezer Option” feature of the WINE-STAT II is NOT needed for a refrigerator configuration, and will not offer supplemental control of the freezer section. This option is meant only for those installations using a stand-alone freezer for wine storage. 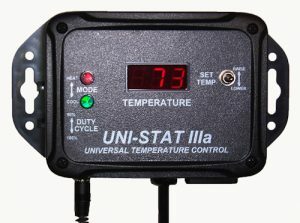 4) Can the compressor be damaged by using the WINE-STAT II for its control? No damage will result, since the compressor is operating for less time and also less frequently than normal in order to maintain a higher-than-normal temperature. In fact, the total lifetime of the fridge will be extended. 5) What about power consumption? To maintain temperatures in the range of wine storage, your wine fridge will operate for much less total time than it would as a normal refrigerator/freezer, resulting in much lower energy consumption and cost. When it is not running, the wine fridge consumes no energy. 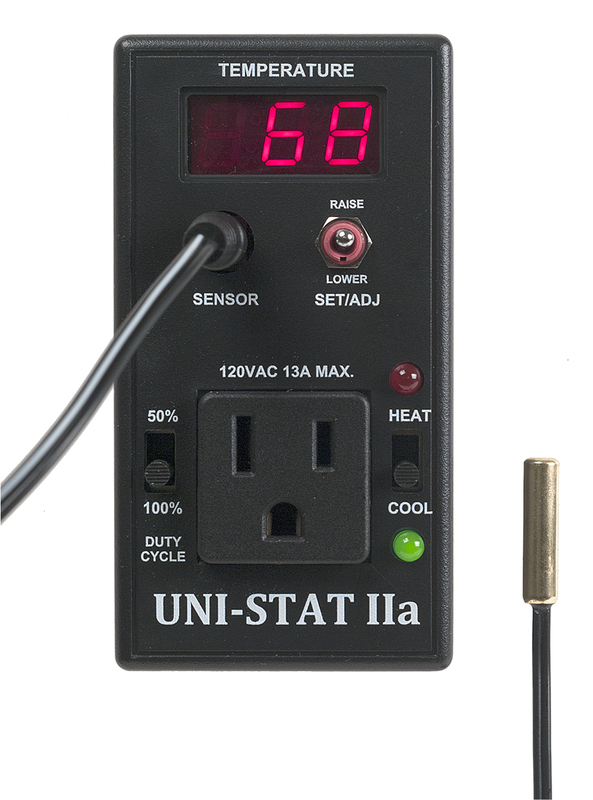 The WINE-STAT II consumes less than 1 watt, which is negligible. 6) What is the “soft cooling” feature of the WINE-STAT II? During the cooling cycle called for when the bottle probe sensor rises above your set-point, the wine fridge will operate for a certain time, then shut off for a certain time, in order to prevent “overshoot” cooling and wasted energy. In this way the cooling of your stored wine is more gentle. The ratio of ON time to OFF time is preset, but the user may change it by using the option available for “duty cycle”. Storing wine in wooden casks, or in upright bottles, requires that the humidity be maintained high enough to prevent wood shrinking or cork drying and subsequent air contamination and oxidation of the wine inside. Humidity levels too high could lead to label deterioration over time in valuable collections. Since neither of these conditions are a factor in the typical wine collection (assuming unopened corked and sealed bottles lying on their sides in the cooler) it has not been shown that you need any sort of humidity control. While it is true that the cooling process will dry the air somewhat over time, it is more probable that frequent air exchange will take place while accessing the wines, thus restoring the humidity level somewhat. For those who feel the need, a small dish of water with a sponge in it should suffice to allay concerns about humidity in the wine fridge. While excessive vibration can be deleterious to wine storage, the slight amount exhibited by a refrigerator (built in the last 60 years or so) is no cause for alarm or concern. 9) Can I use other types of cooling units than a refrigerator, such as an air conditioner or stand-alone freezer? Any type of cooler with the power requirements within the range of the WINE-STAT II’s specifications may be used to configure a wine cellar. A small air conditioner, for example, can be used to cool an insulated space such as a small room or large closet converted to a wine cellar. It will likely be necessary to “bypass” the internal thermostat of the A/C (usually a simple operation) so that it will operate at the cooler temperatures for wine storage. A stand-alone freezer can also be used, but with a risk assumed by the user. This is because of the possibility, however remote, of a malfunction that could cause the unit to continue running long enough to freeze, and thus damage, the wine. For those who choose to use a freezer, the optional freeze protection feature is recommended for the WINE-STAT II which is designed to help avoid this eventuality. 10) Could my existing “wine cabinet” cooling system benefit by the addition of a WINE-STAT II? Depending on the size and shape of the existing cellar system, it may benefit by controlling the chiller on the basis of the wine temperature, such as is provided by the WINE-STAT II’s bottle simulation sensor. 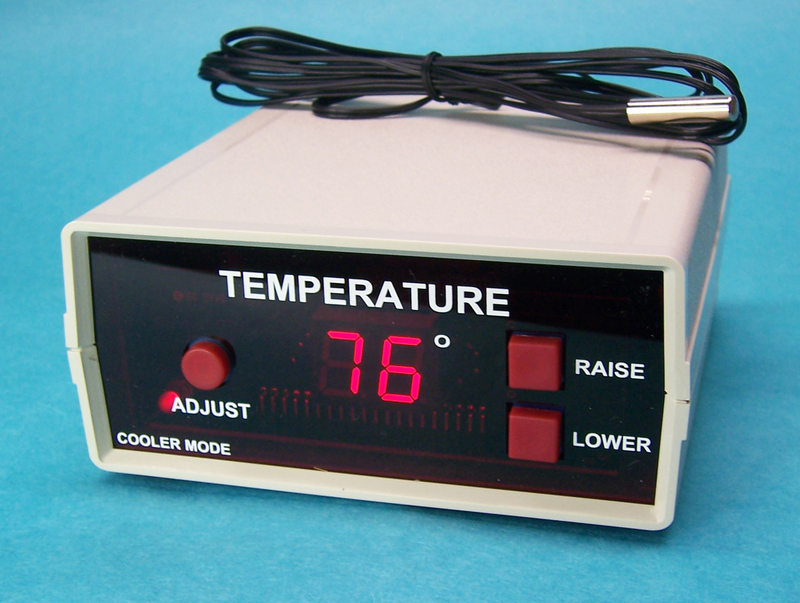 Also, the continuous display of the wine temperature on the face of the WINE-STAT II is an added convenience feature for monitoring the condition of the wine. These two features are offered in some commercially available wine cellar units as extra-cost options, usually at a higher cost than the WINE-STAT II alone. 11) How complicated is the installation? Do I need tools? The entire installation is simply “plug-in” steps, and requires no modifications of your refrigerator or its thermostat. The actual installation activity should take about five minutes (some time is required for pre-cooling, etc.). 12) How should the wine be stored in the wine fridge? In any fashion which keeps the bottles on their sides, and which provides for reasonable air circulation between the bottles for temperature consistency. A small collection may be stored on the existing shelving; however, it is considered preferable to remove the shelving and place the wine in some sort of wine racking arrangement. Several sources provide custom wooden wine racks, such as those maple ones supplied by The Wine Rack Shop http://www.winerackshop.com. Simple, “tinker-toy” type rack kits are available at most import outlets and similar stores. An inexpensive and effective approach is to use small sections of plastic underground drainage pipe (standard 4″ diameter, perforated), stacked in the fridge like logs. A set of FREE plans is available with purchase of a WINE-STAT II upon request with which the do-it-yourselfer can assemble a custom wooden wine rack (see WINE/BEER Storage page) to fit the specific available space in the wine fridge. 13) Does it really work? What kind of reliability history and Warranty does the WINE-STAT have?